This month’s Mixology Monday is being hosted by Matt Rowley of Rowley’s Whiskey Forge. The topic, Hard Drinks for Hard Times, I’m sure hits home for a lot of us. My 401K is down 8.9% for 2009 (don’t even ask about 2008), I have friends and relatives who have been laid off, overall times truly are hard. Thankfully I’m in a lucky position working at a stable job that I enjoy. That doesn’t mean I can’t do a little cutting back on spending though. On that note I’d like to offer up my Recession Gin and Tonic. If you’ve been reading CH for a while now you already know about my love of the squeeze lime, which I waxed poetic about for MxMo XXXII. However, not everyone agrees with my use of bottled juice as is evidenced by the haiku battle that raged in my blog comments. I’ll certainly grant you that squeeze lime, or really any bottled juice, doesn’t offer the freshness of flavor that fresh juices bring. On the other hand, they do offer convenience and affordability, which is key to surviving tough times. For this G&T recipe I’ve used Burnett’s gin. I picked up my first handle of Burnett’s after reading this review by Jonathan Forester. Jonathan nailed it in his review. This is a gin that is very inexpensive but packs a good deal of flavor. It has a nice amount of juniper and the citrus notes are strong enough to make it a great gin for a G&T. Finally, I went with Canada Dry tonic water, my now favorite super market tonic water. Clearly I could have chosen to go with store brand tonic water, but even though I’m going for an inexpensive cocktail here, I still want it to taste good. I am actually drinking these afterall. So how hard is this cocktail going to hit your wallet? It’s not going to hit it hard at all. It’s going to be like a kitten falling on a pile of pillows. Eighty three cents. Try to wrap your head around that number. That’s cheaper than a soft drink nearly anywhere. It’s cheaper than a crappy cup of coffee from the vending machine in my office. And to make things even more impressive keep in mind that none of the ingredients that I used were on sale. If you were able to score these on sale I think you could drop your total cost per drink down to around $0.65 easily. Bam! Recession solved…Oh, wait. No, not really. At least you’ve got a tasty beverage to keep you going though. At a lot of grocery stores you can buy a massive bags of limes. I know refrigerating them kills the taste and yadda yadda, but a huge back of limes for $1.99 isn’t anything to scoff at. 2oz gin, half a lime’s worth of juice and 4-6oz of tonic water make for the best gin and tonic you’ll ever drink. Bottled lime juice tastes awful, no matter where it comes from. I’ve been known to buy a bunch of limes or lemons, juice them and keep the juice in squeeze bottles in my fridge for up to a week or two. You definitely lose some of the fresh juice brightness within 24 hours or so but, as you said, it’s still a damn sight better than bottled. Heck, I’ve been seeing Gordon’s Gin in the Boston area for between $16.99 and $19.99 a 1.75L bottle. Pretty decent gin as well. Next time I’ll try Burnett’s. 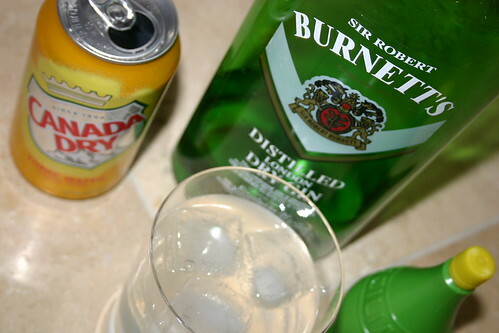 I have tried Burnett’s Gin … it’s used for “well drinks” at a local steak joint: The stuff is just vile. And Realime? My Gawd! I may have to “do without” because of the economy … but that’s all the more reason to insist on Beefeaters, Schwepp’s and a fresh lime when I do get to sit down for my favorite drink. Or … just pick up a bottle of Bud. $15.99!!! Where do you live? I’m in Washington, and Burnett’s, Gilbey’s, Gordon’s, all $28.75 for a 1.75L. You are lucky.